As a husband and wife development team, Alix Stolzer and Calvin Goble worked out a system that saw them through the first few years of crafting games: Calvin made their first two titles, Tiny Plumbers and IGF nominee Neverdaunt: 8Bit, while Alix worked a 9-5 job and provided input in her spare time. The situation was satisfactory, but eventually, Alix wanted more. "While money was coming in from our games, it really wasn't enough to pay the bills," Alix told me. "We decided we'd rather reduce living costs and rough it, instead of one of us working a 'real' job. The opportunity came quickly." A friend offered them the opportunity to be his "mountain neighbor" in Vermont – meaning they would live in a mountainside forest, in a home they'd craft themselves out of trees and tarp. There, they could survive on $150 a month, plus food. Alix and Calvin seized the moment. "We sold our house and used as little money as possible to build a small house-tent thing eight feet off the ground, on a platform our friend had made out of four trees," Alix said. "We spent maybe $1,000 on it, really using thrifty things like greenhouse plastic, and making our own solar panels, etc. It's an awesome adventure, but the downside is it slows down game development." The mountain, miraculously, hosted a strong cellular internet signal, and on sunny days Alix and Calvin were able to charge their laptops, one at a time, using the homemade solar panels. Cafes and the college campus in town, a half hour walk away, provided power and internet on cloudy days. Everything – food, heat, power, water – took extra time in the mountain home, Alix said, including video game programming and design. But the tree house didn't stop their game development. As the studio Robot Loves Kitty, Calvin (the Robot) and Alix (Kitty) brought their latest game, Legend of Dungeon, to PAX East, using not a lot of money and earning wild success. Legend of Dungeon's journey to PAX East began with a punt out the door, when the game's Kickstarter campaign ended in December with $33,000. Robot Loves Kitty asked for just $5,000, and thought even that was a stretch. "When we started the Kickstarter we were concerned we might not reach our goal at all," Alix said. "We broke the game up into stretch goals in the hope that we could make the game more fleshed out, in case people did like the idea. When we got fully funded in under 24 hours we were flipping out; it was very exciting to have such a solid response from people." 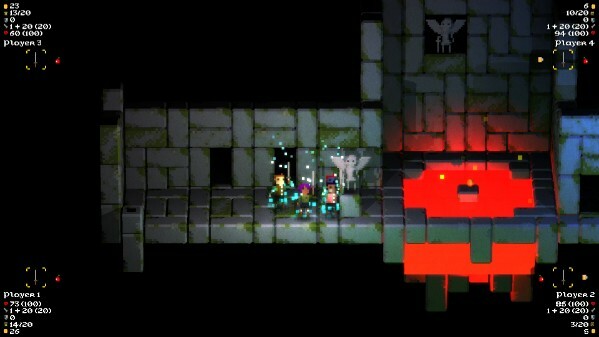 The Kickstarter money allowed Alix and Calvin to work on Legend of Dungeon full-time, and right before PAX East, it launched in nearly-beta form for PC, Mac and Linux via the Humble Store. Legend of Dungeon is an atmospheric, roguelike action RPG with beat-em-up elements and a gorgeous lighting mechanic, playable alone or as a classic, local co-op experience for up to four people. I got my hands on it during the show, and it's challenging to play, pretty to watch and heaps of fun, even playing with complete strangers. Legend of Dungeon is a game made for conventions – not that Alix and Calvin were focused on this selling point during development. They only realized they could have a booth at PAX East one and a half months before the show kicked off on March 22. "We started out by mildly panicking," Alix said. Once the shock wore off, they asked veteran convention attendees for advice online. They made some friends in the process, and Alix baked them cookies as a "thank you" before leaving for the show. Alix and Calvin wanted a booth that stood out in a convention hall crowded with AAA developers and loud, flashy indies, and even though the Kickstarter cash got them to PAX East, they didn't want to spend more than $100 on an actual display. They succeeded on both fronts, Alix said. "We knew that compared to all the large indie studios and AAA games, we were virtually unheard of, so we were prepared to stand in our booth and play the game by ourselves the majority of the time. What actually happened was that from the time the expo hall opened until well after it closed, people were playing. There were even a few times when a crowd formed, almost blocking the paths. It was amazing." Alix estimates up to 4,000 people stopped by the Legend of Dungeon booth, and 350 people actually played the game over the three days of PAX East. A few of the 4,000 turned out to be representatives from Nintendo, Sony and Adult Swim, each of whom expressed interest in the game and gave Alix their cards. Still, she noted the small moments that made the entire show special. "There were a lot of wonderful little moments," Alix said. "Fathers playing with their young children, getting asked to sign things – like a rockstar! – and having a few people take out their phones and buy the game on the spot." Alix and Calvin are staying with family in New York while development of Legend of Dungeon wraps up, but they haven't technically moved out of that tree house in Vermont. "We saved a lot," Alix said. "I would say to anyone looking to save money: Look at your absolute basic necessary living requirements and meet them. The rest is bonus, and it's up to you if you want to pay for them or not. That doesn't mean you have to live in the woods, but you also don't have to live like everyone else." Away from PAX East, Alix and Calvin have time to breathe and consider their options with Legend of Dungeon. It's doing well on Steam Greenlight, hovering around No. 14, and they have an Ouya dev kit, with a final launch on Ouya, Android, PC, Mac and Linux scheduled for this summer. As for those big publishers pushing their cards at Alix, "We've really just started to look into it all. None of this even seemed possible a few months ago, so we'll be taking our time so that we make good decisions."